When James Catford became the Chief Executive Officer of the British and Foreign Bible Society he put a television in the lobby of Bible House. It was tuned to Sky News. The television anchored the small waiting area, past the reception desk, outside two separate doors, one of which led to meeting rooms and the other to a staircase that took you up to an open plan office, where many of the staff had their desks. Next to the waiting area was a small, partly glass-walled room, interior to the building, that staff could use for collective prayers, if they so wished. As a visitor you would not necessarily know this, however; assuming your eyes weren't drawn to the television screen there was nothing in the prayer room that would have caught your eye. Bible House was built in the early 1980s: nothing about it catches your eye. It is hardly unusual these days for a waiting area to have a television. But what was going on here had very little in common with the television in a doctor's office, airport lounge, or car repair shop. At Bible House the television had little functional value. Unlike in other waiting areas, you didn't need to mollify your boredom; I never saw a visitor have to wait more than five minutes. There weren't many visitors to begin with, anyway; Bible House is not the kind of workplace with a steady stream of outsiders coming through. This television was part of a theological message. This television-tuned always to the news-was a statement that what goes on at the British and Foreign Bible Society is in and of the world. James Catford was proclaiming that the Bible is public. This book documents a vision of Christianity as a public religion. In it, I explore the ways in which a group of staff at Bible Society, called the Bible Advocacy Team, worked to counteract the idea that religion ought to be, or even must be, a private affair-"disconnected" from the wider world, concerning only matters of personal belief as if they could exist independent of wider realities. Their vision of religion refuses to keep to itself-to leave politics to politicians, the cosmos to scientists, culture to artists, media to journalists, and the economy to bankers. In the Society's vision of public religion, Christianity should connect to and even ground all such social institutions and networks. The staff's goal, as expressed in the Society's motto, was "making the Bible heard." And for them it had to be heard loud and clear. The staff approached this goal in a variety of ways and means, and with a variety of audiences and publics in mind. To engage "the man on the street," as they often put it (although I'll say person), they ran major advertising campaigns and sponsored art projects, one of which involved Christmas decorations for the local town center shopping arcade. To engage fellow Christians and the churches, they launched a Bible study program designed to take place in coffee shops and pubs; they also established close relationships with a number of politicians, encouraging them to "think Christianly" about public service. And to engage the media and "chattering classes" they established a think tank, which published reports and put on major events to do with everything from the provision of chaplains in state-run hospitals to the value of Charles Darwin's legacy. In all this they were striving to be God's agents. 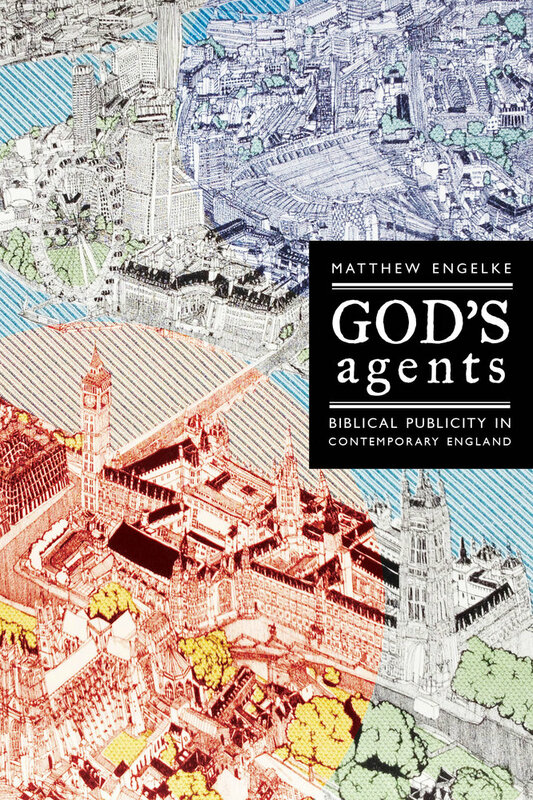 In this study, the term "God's agents" has three main connotations. Above all staff at Bible Society, and especially those on the Advocacy Team, can be understood as public relations agents for the Good Book. In all the work they did, they were trying to promote and in many cases improve the image, relevance, and uptake of the Bible. And it was about promotion-not proselytization. At least not in any straightforward sense. Bible Society is not a missionary organization. For most of its history the Society has functioned as a publishing house, providing Bibles to a worldwide network of churches and missionary societies, as well as the hospitals, schools, prisons, and other such institutions they run or service. Before becoming CEO, James Catford worked for both HarperCollins and Hodder, two of the UK's major commercial publishers, as an editor and publishing director. 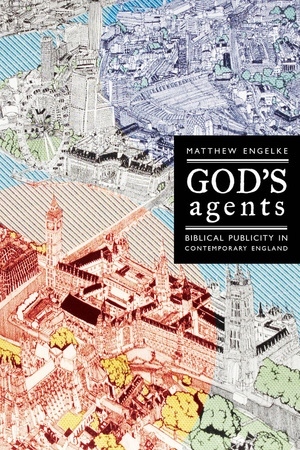 "God's agents" is meant to capture a sense of the Society's historical work and current set of influences: the staff as PR agents, as literary agents, working non-stop to promote their star author and His book. And indeed one of the main points of this book is that when we talk about "public religion" today, we're often actually talking about "religious publicity." Staff at the Society are also agents in the sense that they understand the role of Christians to be central to the realization of the Kingdom of God. They subscribe to theologies in which waiting around is not an option. Withdrawing from the world is not possible. Keeping one's faith to oneself is unthinkable. And while there is a clear line between the power of God's will and their own, staff understand it to be God's will that they be active in the world-that they redeem the gift of human freedom and become socially engaged, going public with faith. But God's agents are not only human. From the wind of the Spirit to the power of the printed word, there has been a long-standing conviction within Bible Society that inspiration, revelation, and change come about in numerous ways. It was during an earlier research project, on apostolic Christians in Zimbabwe, that I first came across this central tenet, one indebted to the evangelical tradition out of which the Bible Society movement emerged. Literature produced by Bible Society has often included tales and testimonies of the Bible's agentive qualities; falling open to a particular chapter and verse-to exactly what a given reader needs to hear-is by far the most common. There are many others. One that stays in my mind is the Bible in a supporter's chest pocket that "took a bullet" in the Boer War. "This Bible saved my life," said the man (in Smit 1970:130). "The Bible reads people," a phrase I first heard in Zimbabwe, was invoked as well in England-and not without realization of the intimation of enchantment. Indeed, while on the face of it what the Advocacy Team did everyday revolved more around the language and logic of marketing-the PR side of things- every act of advocacy is based on an underlying appeal to the mysterium. James and others were quite clear that Christians cannot wait around for the Book to do all the work-it doesn't always fall open at the right spot on its own, and it doesn't take everything that life shoots at us. But this "magic," as James and I once discussed it, is a key aspect of what inspires the Society. The term "public religion" has come to mean religion which refuses to accept any demand to restrict its role to private life. Central to this demand, certainly in terms of how staff at Bible Society understand it, is that religion be made over into a matter of "personal beliefs," self-cultivation, and other-worldly concerns. Within the West there are two traditions of thought associated with this demand of particular note to the Society: the Enlightenment tradition of philosophy and the liberal tradition of political theory. In many cases these traditions overlap, coming together under the label of "modernity." Indeed, liberalism is "pre-eminently the political theory of the Age of Reason" (Canovan 1990: 9); all the same, the Enlightenment and liberalism should be recognized as separate and as having diversity within themselves.1 According to the Enlightenment story, one general justification for the removal of religion from public life is its irrationality and unreasonableness. The work of some Enlightenment philosophers is in fact antitheistic-anti-religious-and the privatization of religion can even be seen by them as the first step in its eventual elimination. Although the liberal story is often perceived to be anti-religious, because of its insistence that religious talk be left out of political debate, liberalism is not always driven by the same kind of reason as the Enlightenment tradition which denounces religion. The liberal justification for religion's privacy is not out of fear that it is inherently irrational, but that it is one of many particular discourses which hampers the realization of justice. In this schematic view, the Enlightenment thinker might say, "religious belief is irrational and anti-modern; if we can't get rid of it altogether, we ought at least to keep it as far away from the workings of political power as possible." Whereas the liberal might say, "religious belief is not a good base for political argumentation, especially in a pluralist society; it's only ever likely to cause divisions and lead to people talking past one another. If an argument can't be won on the basis of appeals to 'common reason,' then it's not worth making." These are the two perceived demands of privatization that drove Bible advocacy. Neither of them was countenanced in Bible House. Some members of the Advocacy Team spoke about the Enlightenment and liberalism in their day to day work. As one team member put it to me, charting what he saw as the challenge to faith: "It really started big-time, I suppose, with Copernicus and the Enlightenment. And obviously Darwinism and all that kind of thing. So basically, gradually, as scientific materialism took over-took hold in Western society-the Church has gradually lost more and more ground." We will get to science and Darwin's connection to all of this toward the end of this book. But the legacy and power of these traditions was crystallized in another word-also hinted at in this remark-the many meanings of which will be explored in the chapters that follow. That word is secularism. Secularism was not a wholly dirty word in Bible House, and there were many ways in which the work of Bible advocacy was meant to own it, and even champion it, as a Christian concept. As what follows will show, there were important ways in which the Advocacy team wanted to be secularist, or, even, secular-at least sometimes. And in some instances "secularism" and its cognates were used descriptively, without a note of anxiousness or annoyance: when team members spoke of "secular culture," for example, they often just meant things which were not part of the church or of a religious character. But in other cases when the staff spoke about "secularism," the "secular authorities," or "secular humanism," they were highlighting what they took to be persons and points of view insisting that religion be kept out of sight. Sometimes the further implication was that these persons and points of view were hostile to religion altogether-that out of sight was a start, but that out of the frame would be much better. In some cases the hostility was seen to be underwritten by a comforting sense that religion is on the decline anyway-that society is undergoing a process of "secularization" in which the spark of faith will fade. In other cases the hostility was seen to be underwritten by an active effort to extinguish the spark; not content with the hand of history, some secularists were seen as wanting to help with the snuffing out. Like other perceptions of public moods and social states, this one among the staff at Bible Society got encapsulated in a sound byte, a pithy phrase that summed things up: "We don't do God." Ever the good agents, they deployed this phrase with great effect. It was taken from Alastair Campbell, Prime Minister Tony Blair's Press Secretary, and it reverberated-as a challenge-throughout all efforts at Bible advocacy, and, even, more widely throughout the public sphere and Christian publics and counterpublics in Britain. The simple reading of Campbell's pronouncement is that political figures in Britain must work according to a secular settlement in which faith remains private. This is a generically liberal position-something along the lines that religion and politics ought to be separate. Alongside this, though, Campbell's words have been interpreted in other ways. By 2003, which is when he said it, Campbell's public persona was as the "devious high priest of spin," and an aggressive and bombastic one at that.2 He was certainly never afraid to confront those whom he felt were in the wrong, or misrepresenting Blair or the government position. Campbell spoke his mind in plain language. On the occasion when he declared that God would not be done, Campbell was replying on Blair's behalf to a question from a Vanity Fair reporter who had asked Blair about his Christian faith. It was well known at the time that Blair held a strong faith, and in the context of his relationship with President George W. Bush, with whom he was embarking on a war in Iraq, that faith had become a particularly interesting issue among Britain's chattering classes (i.e., people who read Vanity Fair). What was remarked upon at the time, and subsequently, is that Campbell felt empowered-even compelled-to answer on Blair's behalf. In accounts of the exchange, Campbell is even described as having "interrupted" the Prime Minister.3 For the staff at Bible Society-and a good number of other Christians who participate in the public sphere-Campbell's attempt to keep religion "out of public" in this memorable instance served as a troublesome indication of just how influential a certain brand of the secular settlement has become, a brand that got understood, like Campbell's public persona, to be rather pugnacious, informed by the kind of Enlightenment sensibility sketched above. Moreover, what Campbell said in relation to Blair's position as a politician was taken within the Bible Society and elsewhere to apply to any Christian who wanted to speak up, speak out, or be public about their faith. Alongside Blair one of the most powerful symbols of such an injunction-although there have been many others besides-was a check-in clerk for British Airways, Nadia Eweida, who, in 2006, was temporarily suspended for refusing to remove a cross necklace while on the job. Indeed, just as Blair's boxing in by Campbell, Eweida's case was understood as a bellwether of the societal mood, and reinforced the perception among some Christians that God could not be "done" publicly in any way, shape, or form. Signs of personal faith-be they words, jewelry, or anything else-had to be kept to oneself. The Bible Advocacy Team were not particularly concerned with Alastair Campbell per se; as with all sound bytes, who first said it, and in what context, mattered less the further it circulated. In a post on his blog, several years after the fact, Campbell actually said his words were "not a major strategic statement but an attempt to bring to an end an interview in which an American journalist was asking 'one final question' after 'one final question'..."4 By the logic of this argument, the journalist could have been asking Blair if he was a cat person or a dog person, and Campbell would have replied, "we don't do pets." Campbell is not religious and describes himself in the blog post just referenced as a "pro faith atheist;" he did, at least, devote the core of his career to working for a deeply religious premier. Such clarifications and explanations seem not to have mattered much, however, and Campbell's words have been kicked around the public square like a ball on a school playground. And so: "we don't do God." This simple phrase has had more impact on the terms of debate over public religion in Britain than any other. It has defined the better part of a decade's worth of conversation, debate, perception, and action. Within the Bible Society's Advocacy Team the reply has been, "yes we do!" In October 2009 there was a workshop on "Religion and the News" at Cumberland Lodge, an educational charity in Windsor Great Park. I attended the workshop with a member of the Bible Advocacy Team, who was there as an invited guest. In one of the sessions, one the speakers, a journalist, began with a joke. "There's only one mention of the media in the Bible," she said. "It's in Luke, chapter 8," she continued, going on to cite it from the King James version: 'Then came to him his mother and his brethren, and they could not come at him for the press.'" The journalist's joke got lots of laughs, but raises serious questions about the relationship between Christianity and its modes of publicity. What, in any given place and time, are the legitimate and legitimating forms of proclamation? How, in contemporary England, can and should the Good News garner publicity? How can Christianity be a "public religion"? These are the questions that frame this book. To call something "public" is not a wholly modern thing; the concept, though, has been thoroughly modernized and some might even say commoditized, such that its link to the traditions of thought and life in the ancient Mediterranean world might seem lost. A central premise of this book is that "public," as a term, has historical specificities, and I set out to trace them in new millennium England. But another central premise of this book is that contemporary Christian concerns with publicity are often linked to the ancient Mediterranean worlds recounted by Luke and his fellow apostles; they are certainly so linked by members of the Bible Advocacy Team. God's agents strive for what they understand to be fidelity to the teachings of Jesus, teachings which are, in their view, necessarily "public," in today's parlance. In this respect the gospel lesson that provided the journalist at Cumberland Lodge with the material for her joke is an important one within the Bible Society movement. It is a lesson that underscores the commitment to publicity. Jesus faces "the press" after telling the parable of the sower (Luke 8:1-15). The sower, you may recall, if you know your Bible, "went out to sow his seed," although much of it fell on poor ground and got "trodden down," "withered," and "choked;" yet "other fell on good ground, and sprang up, and bare fruit an hundred-fold." After explaining the meaning of the parable to his disciples-"on the good ground are they, which in an honest and good heart, having heard the word, keep it, and bring forth fruit with patience"-Jesus continues by invoking another image. "No man," Jesus says, "when he hath lighted a candle, covereth it with a vessel, or putteth it under a bed; but setteth it on a candlestick, that they which enter in may see the light. For nothing is secret that shall not be made manifest; neither anything hid, that shall not be known and come abroad" (Luke 8:16-17). In this, as in so many other passages of Scripture, God's agents find confirmation of their commitment to being public. The British and Foreign Bible Society adopted the image of the sower as its colophon in 1889, and continued to use it through the late 1990s (Steer 2004: 412). It was a perfect symbol for the Society's goal of spreading the word-of broadcasting the seed. "To broadcast," in fact, is not a term invented for the age of radio and television; the pioneers of mass communication borrow it from the Hebrew prophets (Durham Peters 1999: 206-211; Simonson 2010: 13-17), who in turn borrow it from the arts of land husbandry. "Publicity," which we can define as a condition or quality of being public, is a modern concept. Coined in the seventeenth century, it was, as Jürgen Habermas (1989: 1-26) shows, tied to the emergence of the bourgeois public sphere in Britain (publicity), France (publicité), and Germany (Publizität or öffentlich). The distinguishing feature of the public sphere, particularly in Britain, was its function as an arena for public debate distinct from the workings of the state and society; the public sphere, brought about by the discourse of private persons, could be used to hold both to account. It allowed for "people's public use of their reason" (Habermas 1989: 27) and the force of arguments was carried not on the basis of any given person's status ("so says the king") but, rather, the rightness of the argument itself ("so demands reason"). What allowed for this arrangement to obtain was the medium through which the discourse took place-the medium of the printed word. By the end of the eighteenth century it had become axiomatic to assume that the precondition for any project of enlightenment or political enfranchisement was the democratization of print. Publicity in the early modern era was governed by what the literary critic Michael Warner calls "the principle of negativity" (1990: 42). For an argument or idea to be properly public it had to bear a negative relation to the person making it. The "republic of letters" became a powerful metonym of the age that located authority and legitimacy in printedness, in disembodied "publication." In such a republic "social authority, like truth, holds validity not in persons, but despite them; it is located not in the virtuous citizen nor in God nor in the King, but in the light of day, in the supervision of publicity itself" (Warner 1990: 82). Such a republic has, of course, never really existed. Habermas' depiction of the public sphere is idealized-one prominent sociologist calls it a "hazy unreality" (Thompson 1995: 261)-and glosses over important considerations. For one thing, entry into the bourgeois public sphere was never as straightforward as letting reason flow forth from one's pen. As many of Habermas' critics have stressed, those pens tended to be held by certain classes of white men-a fact of personhood never fully negated (see, e.g., Calhoun 1992; Fraser 1992). Habermas has also been questioned for his elision of religion; The Structural Transformation of the Public Sphere, published first in 1962, leaves religion largely out of the story (see Zaret 1992 for a discussion pertaining to the case of England), and certainly cannot accommodate the subsequent constitution of public spheres outside the West in which religion has played a central role (Hirschkind 2006; Meyer 2004; Meyer and Moors 2006; Rajagopal 2001). Habermas has taken many of these criticisms on board (see Habermas 1992), and notably amended his view on public religion over the years (Habermas 1998; 2008; 2011). In any case, even for him, if a truly laudable public sphere ever existed, it has long been lost. By the 1830s the public sphere had been tainted by commercialization and, over further time, the reintroduction of personality-especially with the development of new media technologies such as radio, film, and television. Certainly when we think of "publicity" today we are less likely to think of the social and political projects of John Stuart Mill or Benjamin Franklin and more likely-much more likely-to think of the junkets and tours of Hollywood actors and pop stars. The understanding of what's public remains as much of a "clouded amalgam" (Habermas 1989: 1) as ever. Yet invocations of the public, and the promises of freedom, democracy, and enlightenment such invocations suggest, remain deeply attractive. What is more, not all observers are as dyspeptic as Habermas about the effects of new mass media on publicity's qualities and potentials (Calhoun 1992; Latour and Weibel 2005). And more generally, Habermas' many critics are often admiring critics; they do not want to throw the baby out with the bathwater. However they may be defined, though, enlightenment, democracy and other ideas and ideals associated with "the reinvention of publicness" (Thompson 1995: 235-265) integral to the narrative of modernity are never "the exfoliation of material technology" (Warner 1990: 6). Books do not make a world good all on their own; neither does revelation or salvation. These things have to be got at through social and political relations, and are shaped by the currents and contingencies of history. Within Christian traditions-even those strongly evangelical ones in which the agency of the book is palpable-this is often, actually, recognized. The agency of scripture is only ever part of the story. As John Durham Peters reminds us, within the context of his wide-ranging study on the idea of communication, "the parable of the sower celebrates broadcasting as an equitable mode of communication that leaves the harvest of meaning to the will and capacity of the recipient" (1999: 52). Audiences and publics have always mattered in this way for the Bible Society; audiences and publics have always been part of the equation of publicity. As clouded as our understandings may be, there remains in the contemporary moment a lasting commitment to a central aspect of the early modern acclamation of public things. Public things are supposed to be good things.7 Part of what makes them so is the normative demand that they must be free of "personal agendas" and "private interests." That which is public ought to be illuminated by the light of day and nothing else; certainly not the light of the candle of which Jesus speaks in the Gospel of Luke. In England, the character of publicity still creates awkward conditions for the presence of God. The insistence on disembodiment-the separation of rightness of word and deed from the subject who expresses them-is, for many Christians, an unpalatable and unhelpful demand. It contravenes the essence of Christian self-formation and social relations alike. This is the root of the problem for proponents of public religion, and this is where the stories of enlightenment, liberalization, and secularization come together to set the scene for the Bible Advocacy Team. The central argument of this book is that we cannot understand contemporary formations of the secular without paying attention to the dynamics of publicity. What the dynamics of publicity reveal in this case is that the challenge of the secular for these Christians lies in how to reconcile the principle of negativity with the duty and desire for proclamation, for broadcasting the seed. All the talk of doing God and Bible advocacy was not what I had in mind when I conceived of a project on the Bible Society. Having been trained as an anthropologist of religion with a focus on Africa, my initial thinking was that fieldwork would take me there; I thought I would follow some of the Society's international projects and look at issues to do with religion and development. As part of this I expected to spend time with staff at the Society looking at issues of design, production, and distribution. I thought I might do ethnography of the book as such. I already knew something about the Society's international work. In the research for my PhD, carried out in Zimbabwe, I had interviewed the General Secretary of the Bible Society of Zimbabwe, as well as a team of translators that had been working on a new translation of the Bible into Shona, the Bantu language spoken by the majority of Zimbabweans. I had also read a lot about the Society's nineteenth-century roots, and the important role it played in establishing print cultures and reading publics in the global South. I was interested in the Society during the course of my PhD research because it helped set the social and theological backdrops against which the Christians I was primarily studying had defined themselves. These people, members of an African apostolic church founded in the 1930s, referred to themselves as "the Christians who don't read the Bible;" they reject the authority of Scripture for a combination of socio-political and theological reasons, the former having to do with colonialism, the latter based on what I detail as an ultra-Protestant concern about one's personal relationship with God being mediated in any way (Engelke 2007). While for most Protestants the Bible is not seen as a barrier to that relationship, for these apostolics, it was, and they did without it in the same way other Protestants do without popes and rosary beads. These African apostolics wanted a "live and direct" faith and they saw the Bible as something getting in the way of that. It was the materiality of the text, in other words, that became a major theme in my earlier work, and the work of the BFBS served as a prime example of the ways in which that materiality was otherwise made to matter. The brief reference above to the Society Bible "taking a bullet" for a supporter in the Boer War is a perfect example of how the Book's physical existence has been linked to its metaphysical one; for the strongly evangelical, Bible-loving Protestants who worked for and worked with the BFBS, the Word of God was seen always to have these integrally material qualities. In short, then, one way of explaining my interest in a project on the BFBS is to say that I wanted to switch from studying a group that was no-Bible to one that was all-Bible. The Society is still all-Bible. And yet as the anthropology to follow makes clear, that does not translate today into a single-minded focus on the production and distribution of books. If there is one thing I learned from studying the Bible Advocacy Team, it is that, for them, the Bible is not a book; the Bible ought not to be thought of only, or even primarily, as paper and ink. I soon discovered that if I studied the BFBS, I was not going to be observing or participating in a world full of translators, book designers, and printers. To be sure, next to the waiting area in the lobby of Bible House was a glass case containing a large Bible, opened every day to a different chapter and verse. And you could go upstairs in Bible House, to the open plan office, and find a selection of Bibles on shelves near the desks of the handful of staff who ran the Society's trading arm. But in much of my research, and in much of the advocacy team's work, Bibles were often nowhere in sight. Sometimes meetings were opened with readings from a Bible that someone had brought, but even for a Bible study group I participated in, the Word of God usually came in the form of A4 print-outs from PDF files off a computer, nothing more than a few sheets of white paper. My arrival at Bible House also brought the surprise that, while the Society still works internationally, its domestic projects, which cover England and Wales, were of a wholly different nature, and raised a host of issues I hadn't expected to find the Society involved in. These are the issues of Bible Advocacy. I quickly realized that England might be exactly the kind of exotic and unfamiliar place that whets the anthropological appetite. And so while I did make it to Africa twice for this project-once to South Africa and once to Ethiopia-I turned my gaze to a new landscape of what were to me, especially as an American, uncharted territories. This is an anthropology that took place in Swindon, Camberly, Prestwich, Didsbury, Castle Cary, and London.8 This is also an anthropology, focused as it is on publicity and public religion, that took place in relation to the mediascapes of modern Britain: books, newspapers, magazines, radio shows, television shows, the internet and blogs, events, even billboards and lampposts-these were the platforms of publicity that shaped Bible advocacy, and the mediums through which the staff both worked and envisioned their task. Shifting my focus from Africa to the United Kingdom also meant coming to grips with the sociology of religion. Although anthropologists have worked in Western places for a long time now, and on much more than cross-cousin marriage or collecting origin myths, it's still the stereotype that we all head off to "the bush" in this way (although in Zimbabwe my "bush" was an urban area of over 2 million people). Certainly many of the people at Bible Society and in the research more generally found my professional background surprising. Many of them knew of, and even read, sociologists of religion in Britain. So what could I add? In relation to traditions of sociology based on qualitative research, the answer did not always involve something wholly distinct. And indeed I would like this book to be considered in part sociology of religion, too-contributing to that discipline's empirical and theoretical work on lived religion and secular formations. All the same, for specialists in either anthropology or sociology, some differences will be evident. Had this been written in a more fully sociological mode, the approach to the secular might have been more consistently explicit-engaged with the "secularization thesis" and its afterlife. But as one anthropologist who has written in this area puts it, the secular can also be approached "through its shadows" (Asad 2003: 16)-sideways, as it were, or, as I discuss at various points, through the ambient, background qualities of public engagement. I will return to and reflect upon the scope and methods of my fieldwork at various points throughout the book. To finish setting the stage, however, let me say a further few things about the particular forms my anthropological research took. Above all it involved that most scientific of anthropological endeavours: participant observation-or, more plainly, hanging out. I hung out with people; I sat at the table, and sometimes even said things. I spent as much time with the staff as I could, both in the context of work for Bible Society and, where possible, outside that context. My research began in July 2006 and concluded, as much as anthropological research can ever be concluded, in December 2009. The most intensive period was between July 2006 and October 2007, throughout which I worked full time on the project-sometimes seven days a week. It was during this period that I spent part of each week in Swindon and/or with Bible Society staff in their work elsewhere-mainly London and Manchester, but also the places mentioned above, giving me a taste of the Christian festivals, vicarage sitting rooms, church halls, theological colleges, and even comedy clubs frequented by staff doing their work. At Bible House and in my travels I conducted 74 tape recorded interviews and five video-recorded focus groups. I attended a huge range of both regular and ad-hoc meetings and events. (Bible advocates have a lot of meetings.) In July and September 2007 I interned in the office of the Society's London-based think tank, Theos. On a few occasions, I went to church with staff, and also, as mentioned, participated in a Bible study group during the spring of 2008. As with most anthropology projects, all of this structured and accountable activity was important, but even more so were the innumerable informal conversations I had with people, or those moments before and after an interview in which what's really on someone's mind comes out. This is the crux of hanging out. Anthropology of this kind is about what you discuss over lunch, or what comes up in a taxi or train ride that you share-sometimes intentionally, sometimes by chance. It's about what you can observe with someone at an art museum, when you meet them not to conduct an interview, or even to be especially inquisitive, but just to spend time together to get to know one another. This kind of anthropology is about observations, too: what people choose to read on plane rides to Addis Ababa, or even something as seemingly inconsequential as how they get on to an elevator. All such "imponderabilia," as the famous anthropologist Bronislaw Malinowski once put it, matter a great deal. In addition, this research involved cultivating certain practices of reading, listening, viewing, and surfing attendant to the concerns of the people I studied, and the publics and counterpublics to which they contributed and helped constitute. 1 In addition to Canovan, a number of scholars have, in recent years, highlighted the complicated connections between the Enlightenment and liberalism; of particular relevance to this study are the works of anthropologists such as Talal Asad (see Asad et al. 2009) and Saba Mahmood (2005). Readers interested in these anthropological-conceptual investigations and critiques of what Mahmood calls "the normative liberal assumptions about human nature" (2005: 5) will, I hope, find in the present book an ethnographic take on how these issues play out in England, one of the centers out of which those assumptions emerged. Although from a very different standpoint, the people I studied would insist, with academics such as Asad and Mahmood (or William Connolly, or Charles Taylor, or John Gray) that these assumptions should be questioned, and never taken for granted. 2 "Portrait: Alastair spent hours with Ellie in the hospital," The Observer, 31 August 2003, http://www.guardian.co.uk/politics/2003/aug/31/media.uk 3 See, for example, "Campbell interrupted Blair as he spoke of his faith: 'We don't do God.'" The Daily Telegraph, 4 May 2003, accessible at: http://www.telegraph.co.uk/news/uknews/1429109/Campbell-interrupted-Blair-as-he-spoke-of-his-faith-We-dont-do-God.html 4 "Baroness Warsi misses point of 'we don't do God,' writes a pro faith atheist," on Alastair Campbell's blog, 16 September 2010, http://www.alastaircampbell.org/blog/2010/09/16/baroness-warsi-misses-point-of-we-dont-do-god-writes-a-pro-faith-atheist/, accessed 12 July 2011. 5 "The Blair Years," episode 3, BBC 1, 2 December 2007. 6 See "Judges are biased against Christians," The Catholic Herald, 9 September 2011, http://www.catholicherald.co.uk/news/2011/09/09/judges-are-biased-against-christians-says-archbishop/, accessed 5 January 2012. Eweida's case went all the way to the European Court of Human Rights in September 2012, and a judgment ruling in her favour was handed down in January 2013. Eweida's feeling of "vindication," though (and €2000 in damages), was tempered by the fact that three other cases considered by the court in the same ruling were not seen to have infringed upon the claimants' religious freedoms. See "British Airways Christian Employee Nadia Eweida Wins Case," http://www.bbc.co.uk/news/uk-21025332, accessed 25 February 2013. 7 This point shouldn't be elided to include, say, neo-liberal or otherwise conservative preferences for "the private sector." Even in such political visions, the kind of publicness I'm talking about here is a central value. 8 My apologies to the Welsh; while I did make it to Bala-a town in Wales that plays a central role in the origin story of the BFBS (see Holder 1992)-I was not able to follow the work in Wales. There was a member of the Bible Advocacy team dedicated to Wales, with whom I had many engaging conversations at Bible House in Swindon. But it was too much for the lone anthropologist to cover. Matthew Engelke is a Reader in the Department of Anthropology at the London School of Economics and Political Science. He is the author of A Problem of Presence: Beyond Scripture in an African Church.